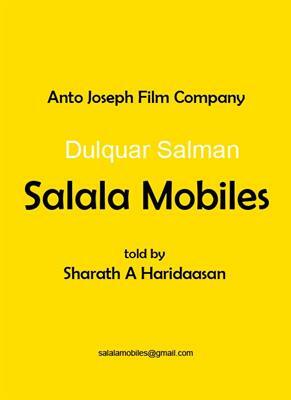 Salala Mobiles malayalam movie is the directorial debut of Sharath A Haridaasan which features Dulquer Salmaan in lead. Produced by Anto Joseph for Anto Joseph Film Company, the movie will be blessed with the cinematographic skills to be provided by Satheesh Kurup. Another highlight would be the presence of 'Fun Aur Masti' movie fame M.S Sheikh Ellahi, who would render his magical fingers to set the tunes for the movie. The movie will start rolling from mid August 2013. The malayalam film industry had proved to be the stepping stone for many artists who kept their performance alive on the silver screen. For those youngsters with true passion and dedication, the entertainment world stood as their career. The year 2013 would be the golden year for the industry while considering only the number of movies released. If reports are to be believed around 150 plus movies are under pre-production making it 200 releases at the end of the year. But the worst part is that only 3-5 movies have gained success in box office. While we welcome new film makers, the dark side is the quality of the movies they offer. Now our point of discussion is about a multitalented young man who had lent his heart working behind the screen for the last 13 years. Enjoying his successful career as a script writer, short film director, editor and producer, Sharath A Haridaasan is gearing up to undertake a project which can be a big step in his career. After directing 'The Dominion', 'The Rituals of Fire' and few other short wildlife films in Africa(Kenya), Sharath is making his big screen entry with 'Salala Mobiles'. In 2004, Sharath who directed an advertisement for Kalyan Jewellers with Mega Star Mammootty, now after 9 years would direct his son Dulquer Salmaan for his debut movie. Produced by Anto Joseph for Anto Joseph Film Company, the movie will be blessed with the cinematographic skills to be provided by Satheesh Kurup. After his brilliant work as music director for hindi movie 'Fun Aur Masti', M.S Sheikh Ellahi will render his magical fingers to set the tunes for 'Salala Mobiles'. Dulquer will join the sets of the movie after finishing his committed projects Neelakasham Pachakadal Chuvanna Bhoomi and Pattom Pole. The movie will start rolling from mid August 2013. Sharath owns two companies;Watercolor Pictures and Brand Pinaki Integrated Media which is having offices at Dubai, Chennai and Kozhikode.